Anyone who has ever done a bunch of soldering and casting, using brass or bronze has had it happen. You are working away, being careful to keep your pickle and other chemicals clean, and suddenly your piece looks as if has been copper plated. You change the pickle, re-pickle the piece, maybe run it in the rotary tumbler with media, but your piece is still “pink”. What now? Well you can physically remove the copper – literally polish the surface of the piece until the “pink” is gone. No fun, and often not very effective. I grumbled to my partner Henry about the problem and he researched it. There was an industrial strength chemistry answer, but dangerous chemicals are low on my list of things to do if I can avoid it. So he did a more directed search on the Internet. Magic! He found someone who understood the problem, the chemistry involved, and how to fix the problem. So, here is how it works. Sometimes the layer of copper is actually “plate” – that is your pickle has been contaminated with iron, which effectively creates a battery, and literally copper plates your piece. Other times you have done some soldering or casting, you toss the piece into the pickle and the black fire scale is removed, but not the copper coating. And worse, sometimes the piece is coated with a reddish oxide that leaves copper behind. What happened? The black is cupric oxide and the reddish or pink coating is cuprous oxide. They are both the result of the heating of the original copper alloy. The pickle removes the black, but not the reddish pink. But there is a “special” pickle that will usually remove the cuprous oxide or the copper plating. And best of all, it does not require any unusual or exotic ingredients. Warning – as with all chemical processes – use this at your own risk! If you leave the piece unattended for too long the pickle may actually eat the surface of the piece away. 3 parts Hydrogen Peroxide (3%) – Available at the grocery store and pharmacy. 1 part white vinegar (5%) – Available in your local grocery. Place the mixture into a plastic or glass container and set the container in a bowl of warm water (100-110F). Place the items to be cleaned in the mixture, and wait. I like to swirl the piece around every couple of minutes to see how it is doing and remove the bubbles. It will develop a brown gunk on the surface. 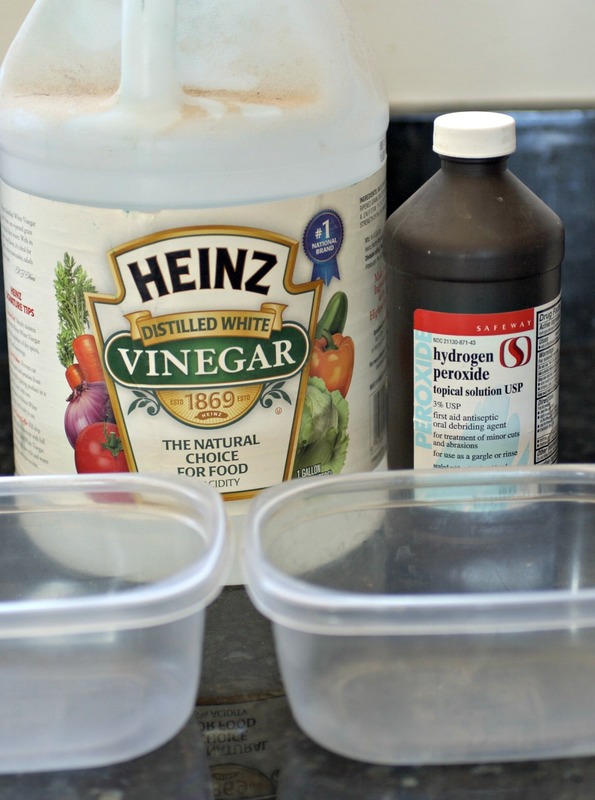 I keep another container with more plain white vinegar at hand, and when the gunk gets too dark for me to see the piece clearly I dump the piece into the plain vinegar. This will clean off the surface of the piece. You may need to rub the piece under a little running water and turn it over to get both sides to clean off. Check to see if the piece is clean enough, and repeat as necessary with the pickle and the vinegar wash. Rinse with clean water when you are done. Polish the piece in a tumbler and you are “back in business”. WARNING: This process will remove every bit of oil from your hands, so if you have sensitive skin, I recommend that you wear rubber gloves. 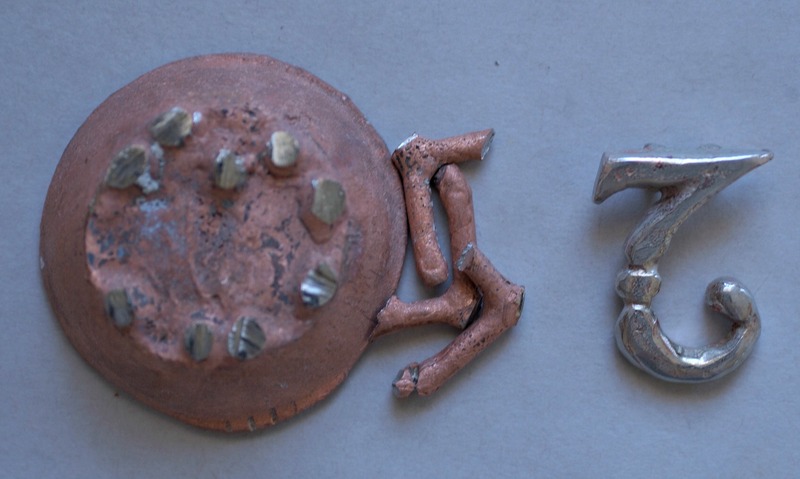 A before and after picture of white bronze that had turned “pink” after being pickled.